Villanova Running: Was this the Best Ever Villanova Track Team? 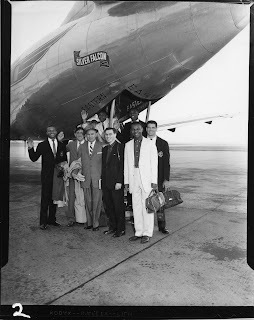 The 1957 Villanova track team is pictured before departure for the NCAA national meet. In front (from L to R) are Ed Collymore, Ron Delany, coach Jumbo Elliott, Alex Breckinridge, and Charlie Jenkins. In back (also from L to R) are Phil Reavis, Charlie Stead, and Don Bragg. Five of these seven athletes were olympians, and combined won four olympic gold medals. 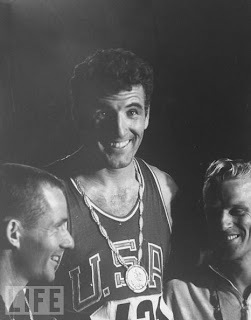 In perhaps the greatest moment in Villanova olympic history, Ron Delany won the 1500 gold at the 1956 Melbourne olympiad. 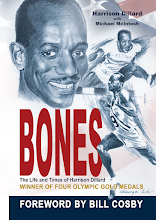 Charlie Jenkins won two gold medals at the same olympic games, in the 400 meters and the 4 x 400 meters (his son, Charlie "Chip" Jenkins, Jr., also a Villanova runner, likewise won an olympic gold medal in the 4 x 400 at the 1992 Barcelona olympics, marking the first time in history that a father and son had won olympic gold medals in the same event). Another Villanovan at the 1956 olympic games, Phil Reavis, an NCAA and AAU high jump champion, finished 7th of the 28 competitors. At the 1960 olympics in Rome, Don "Tarzan" Bragg won an olympic gold medal in the pole vault (see photo below). Bragg set a pole vault world record at the 1960 US olympic trials, to go with the indoor pole valut world record he had set in 1959. Also in Rome, in the famous marathon race won by Ethiopia's barefoot runner Abebe Bikila, the 5'9" 143 lb. Alex Breckinridge (a 15 km and 30 km AAU champion) finished 30th in the field of 69 runners. His time was 2:29:38. One could argue that this 1957 Villanova team was the most accomplished collection of track and field even assembled on the Main Line.